Vive la France! Yesterday was Bastille Day, celebrating the fall of the Bastille prison in 1789 and the beginning of the French Revolution. As the daughter of a French teacher, I feel a patriotic kinship to mes amis francais! Plus they have so much delicious food, so what's not to celebrate? If you get a chance, check out one of my favorite blogs, The Daily Nail. The blogger there makes a new manicure each day, and she took my suggestion for a Bastille Day theme! I love these nails! I included this bento lunch in the What's For Lunch Wednesday post. 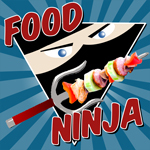 Check out all of the creative bento lunches on Shannon's blog! Wine Pairing Suggestion: I had a sparkling wine from the Alsace region of France, and it went really well with this salad. You could also opt for the very French aperitif called Pernod, which takes some getting used to. I enjoy it with a bit of water poured over ice. The strong anise flavor is very refreshing. That looks delicious! I'm going to check out more of your blog soon to get ideas for my own bentos (although I think my kids would probably eat this one, too). Hi Holly! Thanks for stopping by. I was seriously cracking up over your blog post titles. :-) Very creative! My step daughter is pretty good about at least trying things once, and bentos make it more fun to be an adventurous eater. 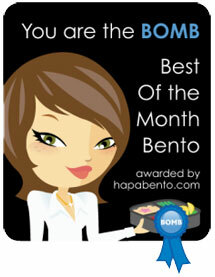 Excellent--I was thinking about a Bastille Day bento, so glad you did one!! 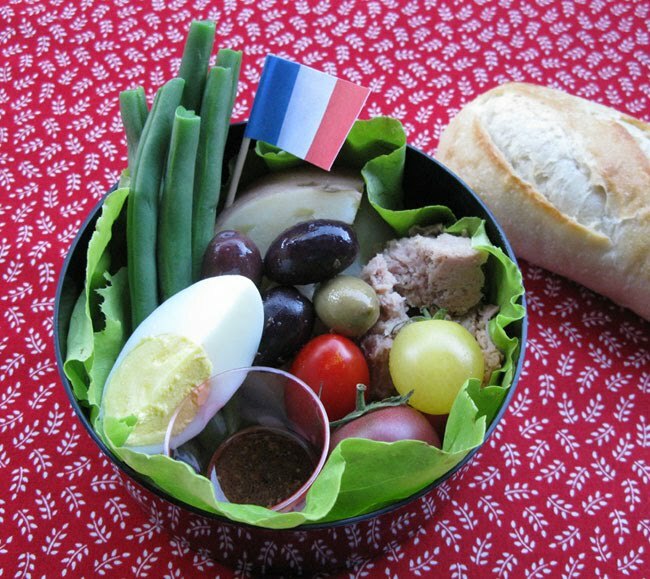 The flag is perfect, the bento beautiful, summery and so French! This looks so good. C'est chouette! Bentobird, thank you so much! I had a hard time deciding which french food to include in my bento: Salade Nicoise of Croque Monsieur? As you can see, I decided on BOTH!